Created on Nov. 20, 2012, 10:34 p.m. by Hevok & updated by Hevok on May 2, 2013, 4:57 p.m.
Genomic variations enriched in for longevity selected flies - Through selective breeding fruit flies, it is possible to increase their lifespan to five times the usual length. Natural allelic variation in InR were associated with variation in lifespan [Geiger-Thornsberry and Mackay 2004; Paaby et al. 2010]. Increased selection on late-life performance results in increased lifespan and late-age reproduction. This increase is often accompanied by decreased early fecundity [Rose and Charlesworth 1980; Luckinbill et al. 1984; Rose 1984; Service et al. 1988]. Experimental evolution was applied by selectively breeding only flies that survived and were fertile at old age by imposing selection on both late-age fertility and lifespan. 156 genes appeared to be under strong selection in for longevity-selected animals. 15 genes exhibited a coding region difference unique to animals under experimental evolution selected for longevity. 13 genes exhibit structural protein variation that likely contribute to effects on late-life health and performance. 25 of 156 genes are differentially expressed in animals that were selected for longevity. 15 genes of the 156 exhibit nonsynonymous changes (or start-codon changes) that were unique to longevity selection. 9 of the 15 identified genes have been implicated in aging, reproduction, immune response or proteolysis. Genes with cis-regulatory changes implicated in extended lifespan and late-age fertility are associated to reproduction (Cct1, karst, and Ten-a), antimicrobial peptides (dro-2 and dro-4) as well as a peptidase (Psa). Immune response has been linked to late-age morbidity in both fruit flies [Sarup et al. 2011] and humans [Bonafe et al. 2001; Franceschi et al. 2007]. Immune-response genes display a large increases in expression with age. Expression of antimicrobial peptide genes predicts subsequently lifespan in individual flies. Long-lived individuals have lower expression of these genes when they are young [Landis et al. 2004]. For longevity-selected strains consistently exhibit gene expression profiles similar to control flies an age class younger. As such longevity-selected lines have a younger gene expression profile. Among the donwregulated genes is a clear over-representation of genes involved in immune functions. About 84 genes are differentially expressed in the longevity-selected animals at the same physiological age. The overlap of the genes at the same chronological and physiological age is about 40 genes associated to longevity. These gene are associated to starvation resistance and immune response regulation . Aging and oxidative stress share the upregulation of purine biosynthesis, heat shock protein, antioxidant, and innate immune response genes. Immune reporter (immune response gene promoter linked to GFP) allow longitudinal assay of gene expression in individual flies and in young flies is partially predictive of remaining lifespan . Selection on longevity and late-age reproduction results in increased lifespan, improved late-age fertility, and decline in early fertility. The changes that render those animals long-lived are in defined genomic regions that alter the function or expression of lifespan factors. Most age-associated gene expression changes in normal-lived flies are abrogated in long-lived starvation resistant strains. Stress-related genes (including proteolysis and cytochrome P450) are generally higher expressed in long-lived flies selected for starvation resistance. Genes involved in reproduction exhibit a lower expression in middle-aged long-lived animals and unlike normal flies a lack of their downregulation with age. Malnutrition strongly affects age-associated transcript patterns overriding the differences between the lines. In contrast, under less stress-full conditions, line and diet effect age-dependent expression similar. It appears that natural genetic variations for starvation response and lifespan can operate through similar transcriptional mechanisms as those of dietary restriction and lifespan-extending mutations . Rose, M. R., and B. Charlesworth. 1980. A test of evolutionary theories of senescence. Nature 287:141–142. Luckinbill, L. S., R. Arking, M. J. Clare, W. C. Cirocco, and S. A. Buck. 1984. Selection for delayed senescence in Drosophila melanogaster. Evolution 38:996–1003. Service, P. M., E. W. Hutchison, and M. R. Rose. 1988. Multiple genetic mechanisms for the evolution of senescence in Drosophila melanogaster. Evolution 42:708–716. Landis, G. N., D. Bhole, and J. Tower. 2003. Search for doxycycline-dependent mutations that increase Drosophila melanogaster life span identifies the VhaSFD, Sugar baby, filamin, fwd and Cct1 genes. Genome Biol. 4:R8. Karsten, S. L., T.-K. Sang, L. T. Gehman, S. Chatterjee, J. Liu, G. M. Lawless, S. Sengupta, R. W. Berry, J. Pomakian, H. S. Oh, et al. 2006. A genomic screen for modifiers of tauopathy identifies puromycin-sensitive aminopeptidase as an inhibitor of tau-induced neurodegeneration. Neuron 51:549–560. Sarup, P., P. Sorensen, and V. Loeschcke. 2011. 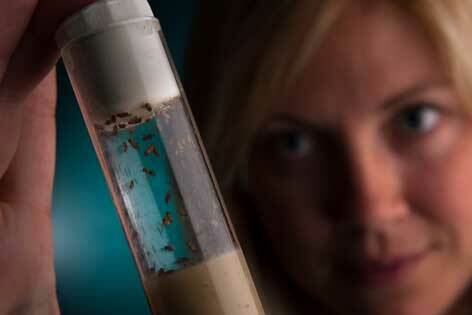 Flies selected for longevity retain a young gene expression profile. Age 33:69–80. Bonafe, M., F. Olivieri, L. Cavallone, S. Giovagnetti, F. Marchegiani, M.Cardelli, C. Pieri, M. Marra, R. Antonicelli, R. Lisa, et al. 2001. A gender-dependent genetic predisposition to produce high levels of IL-6 is detrimental for longevity. Eur. J. Immunol. 31:2357–2361. Franceschi, C., M. Capri, D. Monti, S. Giunta, F. Olivieri, F. Sevini, M. P. Panouraia, L. Invidia, L. Celani, M. Scurti, et al. 2007. Inflammaging and anti-inflammaging: a systemic perspective on aging and longevity emerged from studies in humans. Mech. Ageing Dev. 128: 92–105. Landis, G. N., D. Abdueva, D. Skvortsov, J. D. Yang, B. E. Rabin, J. Carrick, S. Tavare, and J. Tower. 2004. Similar gene expression patterns characterize aging and oxidative stress in Drosophila melanogaster. Proc. Natl. Acad. Sci. USA 101:7663–7668. Geiger-Thornsberry, G. L., and T. F. C. Mackay. 2004. Quantitative trait loci affecting natural variation in Drosophila longevity. Mech. Ageing Dev. 125:179–189. Paaby, A. B., M. J. Blacket, A. A. Hoffmann, and P. S. Schmidt. 2010. Identification of a candidate adaptive polymorphism for Drosophila life history by parallel independent clines on two continents. Mol. Ecol. 19:760–774.